A band of unusually organized orcs has taken to raiding farms and waylaying trqvellers near the local town. The characters must seek out the orc lair and rid the area of this menace, but things are not entirely as they seem. A sinister voice whispers instructions from the darkness; what demonic force lies at the heart of the labyrinthine orc lair? 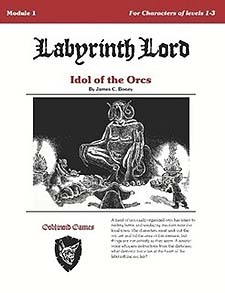 This adventure is for the Labyrinth Lore fantasy role-playing game, and is usable with all older editions of the world's most popular fantasy RPG.